Whether you are in the market for vape supplies or water pipes, fine cigars or custom briarwood pipe, there are a plethora of options as to where to purchase them from. 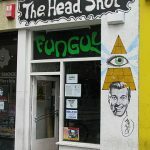 You could mosey on down to your nearest head shop to check out their gadgets and gizmos or tap, scroll and click from an online store… While there are benefits to both methods of shopping, let us weigh some of the pros and cons of each. Buying online: In the technological age we live in, everything is available online now. Everything. This makes it more and more convenient to purchase the items we need for day to day life without ever having to leave home. Most online retailers allow users to leave reviews and ratings for products, making it easier to choose a quality product and know what to expect in terms of performance and overall satisfaction. In addition, often times these online shops allow consumers to sort search results based on these reviews, and include parameters for price, brands, and popularity. Features like these make it easier to narrow a vast inventory of products down to just a few relevant items, saving the consumer time and sometimes money. However, smoking and vaping is often a very personal experience, and most smokers have very specific preferences when it comes to pipes and other smoking paraphernalia. One of the many drawbacks to online shopping is the inability to touch or smell the product prior to purchase. Clients want to know how a product feels in their hands, fits in their pocket, and the chance to examine the quality of the product firsthand. Is it durable enough? Will it break from being in my pocket all day? What if it drops off the kitchen table? When a product is purchased online – even if there are positive reviews – there is still a good chance that you might end up with a flimsy piece of equipment that will ultimately not meet your needs and break after a few uses? These are the questions that can only be answered when one physically views, inspects and tests the products; and websites simply are not up to par on this front. 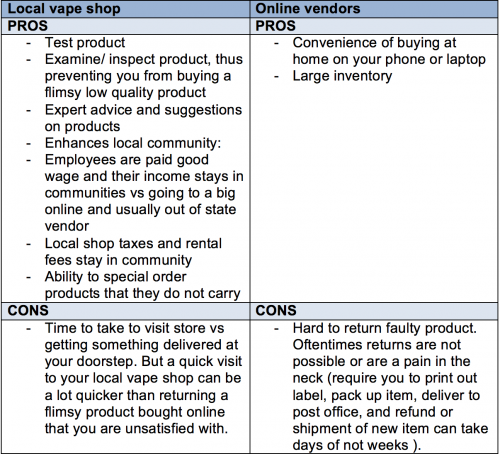 Oftentimes online smoke vendors and head shops will not allow returns on smoking/vaping products due to health concerns, leaving the customer stuck with a product they are not satisfied with. In addition, online tobacco retailers have the ability to stockpile a large inventory compared to local smoke shops. This is due to the fact that they are not having to pay for a storefront and can operate on a lesser amount of employees. For smokers who know what they want or are looking for a specific type of tobacco product, this can very convenient. The downside to purchasing this way is that the client is not able to physically inspect the product prior to delivery. When shopping at a local smoke shop, one is able to feel, smell, and sometimes even sample the product before making the decision to buy. This allows you to ensure the tobacco or e-liquid is fresh and meets your own individual standard of quality. Personal interaction – good customer service and expert advice – is one of the most important things you can experience at a local smoke or head shop that simply cannot be duplicated when shopping online. While very few online smoke shops have added a chat feature or customer support line, it is often difficult to gauge the knowledge of the person you’re talking to (many companies outsource these services to other countries where English is not the primary language). Both new and returning customers can benefit from the vast wealth of knowledge an employee at a reputable smoke shop or vape supply store can give them. This is especially true when it comes to clients that are switching from conventional tobacco products to vaping. When this situation arises, for example, the employee can help the consumer pick out an e-liquid with comparable nicotine content to what they are used to. Once the strength is decided and a vaporizer is purchased, many vapor studios will allow clients to taste different flavors until a favorite is determined. This kind of experience is one that you can only get from walking into a physical store, and online retailers simply cannot match it. If the same newcomer were to buy a vaporizing device and e-liquid online, they could easily get stuck with a device that does not have the features they want, and a flavor they cannot return. What’s more, when comparing retail stores versus “e-tail” stores, one cannot ignore the economic benefits that brick and mortar have over online stores. 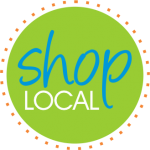 Local smoke shops are more likely to be locally owned, and provide valuable jobs to the citizens within the community. More importantly, these jobs provide entry level training opportunities, which have been shown to have a positive impact on economies. Physical retail stores also pay local taxes and rental fees, so a portion of the money goes back to the same community that the clients live in. in terms of the economics going back to the local economy, it is a double whammy: employees, who are usually paid a good hourly wage, often spend their paychecks locally at home and, as previously mentioned, the taxes and rental fees paid the business stay within that community or city. Once a vaper finds a local smoke shop that he or she likes, it is more likely that the happy customer will keep coming back and furthering their relationship and vape knowledge with employees at the store, thus creating a greater sense of community. Once these relationships are established, the employees are able to more effectively recommend products that are relevant to the consumer’s tastes and interests. It’s a no brainer: by local.